The forehand is most likely the most discussed and in my opinion also most misunderstood shot these days. Forehands in the professional game have changed a lot over the years and are hit with incredible speed and spin! That does not mean that recreational players should copy forehands from professional players though. It is extremely important to master the basics first before moving on to such advanced techniques. Here I would like to share with you my favorite tennis forehand tips that will help you get the basics right and develop a solid forehand! All of the great topspin groundstrokes have a very similar swing pattern and in this video tip I explain what it is and how you can learn it! Sorry, you must sign up for our newsletter before you can access our free videos. One of the most common mistakes on the forehand I see with recreational players is that they try to slap the ball with their wrist too much. The key to hitting a clean forehand is to have a laid-back wrist position around contact! Now there is a lot of talk these days about the pros using their wrists on their forehands and it is true that especially the guys on tour use a lot of wrist for maximum racket acceleration. Basically these guys manage to use their wrist to accelerate the racket before getting into the stable laid-back wrist position around contact. 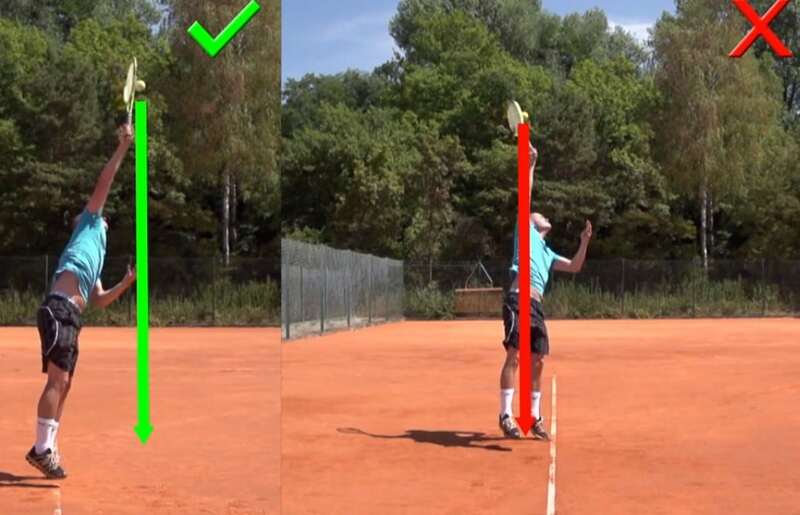 This is very difficult to do and requires great coordination that usually takes many years to develop for a tennis player. So unless you are a professional player or close to turning pro I suggest that you do not worry about this movement for now! For most recreational players the primary goal should be to hit a clean shot first before worrying about maximum racket acceleration. Ok. So how can you work on that ? One of my favourite tips is to finish your forehands with your knuckles by your left ear. This assures that you do not break the wrist forward around contact! 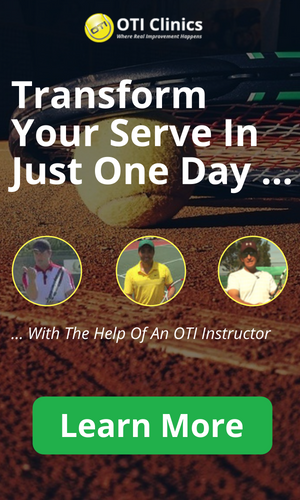 You can either start by drop-hitting some balls yourself or have your practice partner toss you a few balls to your forehand. After every hit you stop and check to make sure that your knuckles are close to and pointing to your left ear! One of the most common mistakes I see on people's forehands is that they overrotate with the upper body. Possibly many players are trying to copy the pros who do use plenty of upper body rotation. The pros use it in the right way at the right time though and they also have to deal with different incoming balls than most rec players. It often seems to me like players are trying to forcefully pull their body around which usually results in really poor shots! A great tip to counter this is to try and keep your eyes at the contact point longer, similar to how Roger Federer does it on his forehand. Keeping your focus there will stop you from rotating too much too early and will force you to finish the shot with a much better upper body position! So again next time you go out on the court try this. It might feel strange in the beginning but keep going for a while and you should see some good results! Another common mistake on the forehand these days is pulling the racket over to the left side of the body too early which results in a short hitting zone. Watching the pros on TV it appears as if they are pulling their rackets over to the left side of the body. Looking at it in super slow motion though you can see that the racket moves forward and upward around contact, which is the only way possible from a physical standpoint to hit the ball deep and with lots of topspin. What's happening is that the pros swing really fast and the racket going over to the left side of the body is only a result of really fast racket speeds. It happens after the ball is already gone from the strings. Everybody out there reading this should most likely work on developing a long hitting zone. What do I mean by this ? I mean that the racket keeps moving forward and upward towards the target for quite a while after the ball is hit! Try this out and I am certain that it will result in better depth and cleaner shots for you! So much for my favorite tennis forehand tips. More great tips coming soon!